Located in a historic train station in the heart of Southampton, Pennsylvania, Steam Pub offers elevated comfort food, hand crafted cocktails, and a wide array of wines and beers. A la carte Sunday brunch is the latest delectable addition, with both sweet and savory dishes aimed at pleasing all palates. Here are five reasons why you should choose Steam Pub as your next brunch destination. What’s brunch without a mimosa in hand? Steam Pub has you covered with the best deal in town. 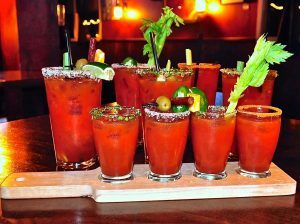 Can’t decide from one of Steam Pub’s six signature bloody mary’s? Don’t stress! You can order a flight, that’s right, an entire flight of different bloody mary’s! Some must try options include The Cucumber Bloody Mary and The Wasabi Bloody Mary. From Chef’s mind to your table. 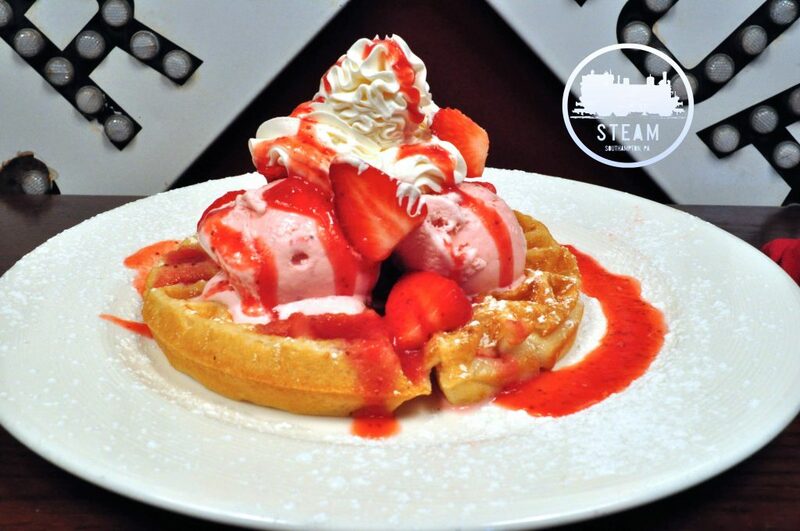 Each week Steam Pub offers numerous menu additions, ranging from seasonal fruit pancakes, creative custom omelets, and even Belgian waffle strawberry sundaes. 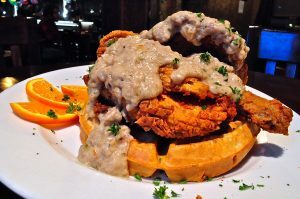 New to the brunch menu, this twist on the classic Chicken & Waffles dish combines a fresh cooked Belgian waffle, homemade fried breaded wings, and southern style bourbon sausage gravy. Prefer boneless option? They offer a chicken cutlet substitute. 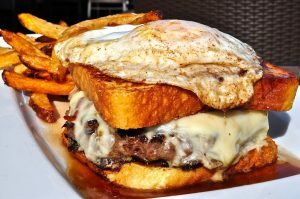 Last but certainly not least, behold The Ultimate Breakfast Burger. An 8oz. beef patty, spicy candied bacon, and American cheese stuffed between French toast and topped with a fried egg and maple syrup. This must try menu favorite covers breakfast, brunch, lunch AND dinner. Steam Pub serves brunch every Sunday from 9:30am-2pm, providing unparalleled service and delicious food in a relaxed environment.